If you type liu.se/library into the address field of a web browser after 23 October, you will be greeted by the new library appearance. 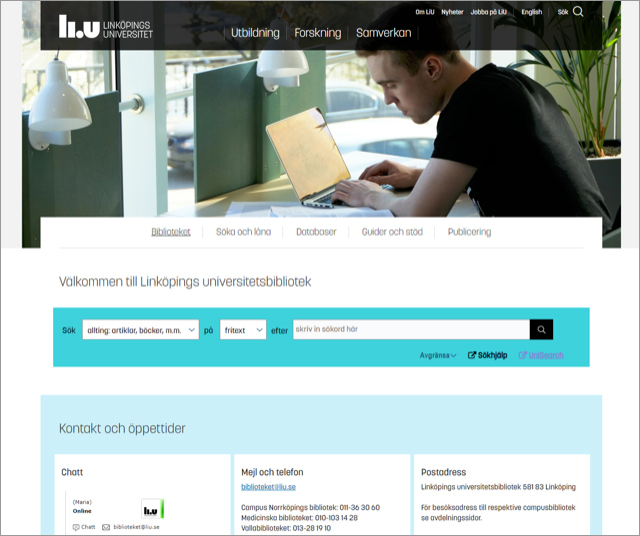 The new library webpages will open on that date, as an integrated part of liu.se. Just as the complete liu.se site is search-driven, so also will the contents of the library be presented based on fewer entrances than in the present structure. Publishing – probably used mainly by researchers. The work started in the autumn of 2017. Links to the old library website will work on a general level. But bookmarks or links to pages under the general level will have to be changed. The library has carried out user testing, but the personnel there are interested in hearing the opinions of users when the site is launched.